Infused with the spirit of their ancestors and unwavering determination to seek accountability and justice, an Indigenous Women’s Divestment Delegation will travel to Switzerland and Germany from April 20th to 28th, 2018. There will be a special event in Zurich, during which Swiss elder women activists will formally welcome the Delegation to Switzerland, strengthening alliances and solidarity between women’s networks, and between nations to bring well-being to the world. Spring 2018 Indigenous Women’s Divestment Delegates comprise both frontline community leaders, and tribal officials who serve or have served in official capacities for their Tribal Nations, including – Charlene Aleck (Elected councillor for Tsleil Waututh Nation, Sacred Trust Initiative, Canada); Dr. Sara Jumping Eagle (Oglala Lakota and Mdewakantonwan Dakota pediatrician, living and working on the Standing Rock Reservation, North Dakota); Michelle Cook (Diné/Navajo, human rights lawyer); Wasté Win Yellowlodge Young (Ihunktowanna/Hunkpapa of the Standing Rock Sioux Tribe, Former Tribal Historic Preservation Officer); and Monique Verdin (Member of south Louisiana’s United Houma Nation Tribal Council and the Another Gulf Is Possible Collaborative) – with Osprey Orielle Lake (WECAN International Executive Director and Delegation organizer). [Full speaker biographies are available here]. Efforts are centered in Switzerland and Germany, two countries which house several of the world’s largest financial institutions supporting dangerous extraction projects across Indigenous territories in the U.S. and globally – despite purportedly high ethical and human rights standards. The Indigenous Women’s Divestment Delegation is facilitated by the Women’s Earth and Climate Action Network (WECAN) International in partnership with Indigenous women leaders and their directives, as part of a growing movement pursuing institutional divestment as an effective strategy to hold banks and fossil fuel related companies accountable to Indigenous rights and protection of land, climate and water. A public event will be held in Zurich on April 26th with short films and panel discussion. “States in the U.S. are imposing laws and severe punishments to criminalize those who protest harmful resource extraction. Despite the abuses which occurred at Standing Rock, many of these banks continue to sign on and renew their financial commitments to the companies involved. Our goal is clear: there must be justice and accountability for banks and corporations. Due to legacy of colonial laws in the United States which fail to recognize and adequately protect indigenous rights we must humbly appeal to the international community for their intercessions. Indigenous peoples are in danger, we need Europeans to act, to divest, to organize within their respective nations to make their banks accountable for indigenous human rights abroad. We need Europe to stand and fight alongside us. 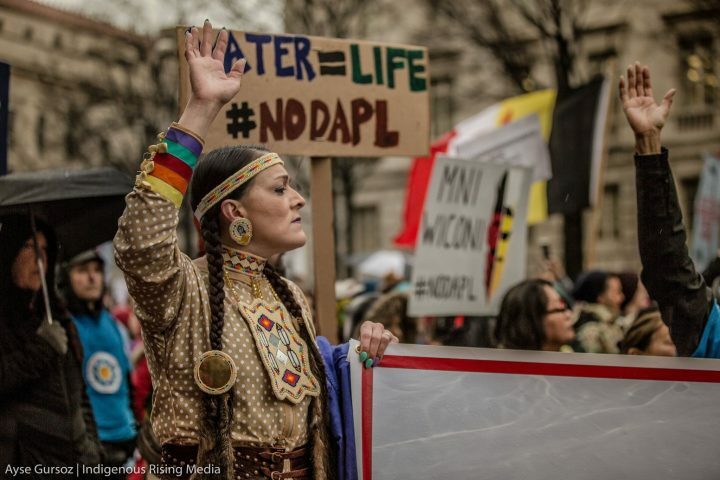 Together in unity, acting as one, in the spirit of mutual aid and defense, we will achieve peace and security for our climate and collective future.” explains Michelle Cook (Diné/Navajo, human rights lawyer). “Divestment from dirty fossil fuel extraction and infrastructure demonstrates a commitment to our collective future and the web of life. What is needed from financial institutions now is a show of leadership and dedication to ecological sustainability, and human and Indigenous rights, as we face the unprecedented challenges of a world plunging into climate chaos. Indigenous women have long bore the brunt of extractive industries, and despite this, shine powerfully with solutions to the harms that come from these destructive practices. Banks need to listen to Indigenous women and adhere to their demands, which are founded on requests for basic respect for obtaining free, prior and informed consent of Indigenous communities, as required under international law. WECAN International stands with the representatives of the Indigenous Women’s Divestment Delegation and is calling for justice and accountability from financial and insurance institutions engaged in fossil fuel extraction. Business as usual cannot continue. Now is the time to move forward towards a clean and healthy future for all.” explains Osprey Orielle Lake, Executive Director of the Women’s Earth and Climate Action Network (WECAN) International. The Women’s Earth and Climate Action Network (WECAN International) is a solutions-based, multi-faceted organization established to engage women worldwide as powerful stakeholders in climate change, climate justice, and sustainability solutions. WECAN International was founded in 2013 as a project of the 501(c)3 Women’s Earth and Climate Caucus (WECC) organization.